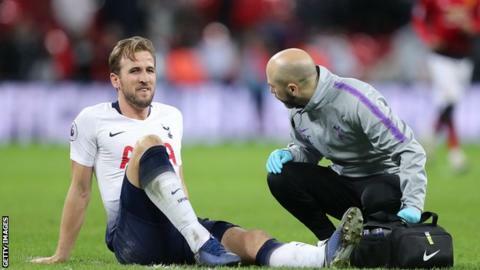 Tottenham striker Harry Kane will be out until March after injuring ankle ligaments in Sunday's 1-0 Premier League defeat by Manchester United. Kane, Tottenham's top scorer this season with 20 goals, is likely to miss both legs of the Champions League last-16 tie with Borussia Dortmund. Kane injured his left ankle when he was caught between United's Phil Jones and Victor Lindelof late in the game at Wembley. Who will score the goals for Spurs with the striker out injured? Tottenham manager Mauricio Pochettino said after the match: "It was a clear foul on Harry Kane, a big hit. [Referee] Mike Dean said he didn't see it." Spurs, who are third in the Premier League - nine points behind leaders Liverpool - look set to be without Kane for the games against Chelsea and Arsenal on 27 February and 2 March respectively. Tottenham's back-up strikers are Fernando Llorente, who has scored four goals in 13 appearances this season, and Vincent Janssen, who has not played for the first team since August 2017. Kane's lengthy absence is a devastating blow to Tottenham at a defining stage of the season as they fight on all fronts. Pochettino has no striker anywhere near the calibre of Kane and he will have looked at the fixture list with anguish as the worst fears about his ankle injury were confirmed. Kane will miss the second leg of the Carabao Cup semi-final at Chelsea - and the final on 24 February should they go through - as well as the FA Cup fourth round trip to Crystal Palace. And with him not scheduled to return to training until early March, he will struggle to make even the second leg of the last 16 Champions League game with Borussia Dortmund - as well as missing a host of league matches. Fernando Llorente is able but not in Kane's class while Pochettino made it clear Vincent Janssen has no place in his plans. Does Pochettino delve into the market? Does he even have the finance to do so? He may have to in this emergency. Kane is the Spurs talisman and their world-class marksman. This development will provide a huge test of Pochettino's management and his team's character.